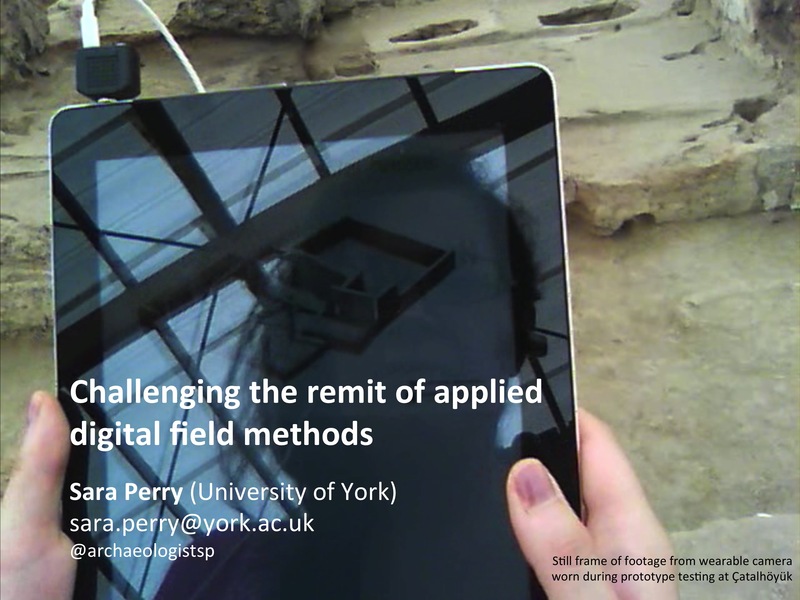 Yesterday I gave the closing talk in James Taylor‘s & Nico dell’Unto‘s session ‘Towards a Theory of Practice in Applied Digital Field Methods’ at the Computer Applications in Archaeology conference in Siena, Italy. Prior to my presentation I’d been feeling quite anxious about the whole affair, not only because of massive travel problems that led me to reach the conference only minutes before I was scheduled to speak, but also because it would be the first time I would formally vocalise many of my deep concerns about the persistent lack of criticality in contemporary digital archaeology. I was conscious of the polemical nature of my argument, the potential that I might offend some (or all!) of my audience, the possibility that I would be accused of hypocrisy given that I’m a great advocate of the power of digital (and analogue) media for disciplinary – and larger socio-political – change, and the chance that I might thus let down my great friend and colleague James (who, if you don’t already follow, you must: his field experience, theoretically-engaged mentality and methodologically-experimental work make him one-of-a-kind in the profession). Fortunately, my talk went well – and, indeed, I was moved by the response I received from the audience, both in person and online. There aren’t that many occasions when I finish a presentation and feel like it might actually have made a difference to the audience – in fact, I would say a lot of the time it’s the opposite: I leave deflated, exhausted from the performance of it all, and disappointed in myself for the experience. But yesterday I was genuinely taken aback by the positive reception, and I’ve copied below some of the tweets that really impacted me–especially because they so succinctly and effectively captured the nature of my argument [and they made me smile :) ]. I’ll prepare my talk for publication soon, but as it touches on so many issues that I grapple with in my everyday working life, I wanted to blog informally about some of its dimensions here. My professional expertise is in both studying the process and effects of—as well as experimenting with the creation, curation and distribution of—media for different archaeological/heritage specialist and non-specialist audiences. By media I mean everything from illustration and photography to film, exhibition, mapping, virtual/augmented/mixed reality apps, audio recordings, animation, etc. I make these media or teach others to make them (see examples here, here, here), or, most often, collaborate in their production; and I spend an equal amount of time making, teaching and collaborating in their critique and evaluation. All of my most profound moments of learning have come about in navigating this boundary between creating and critiquing – because, done separately, they can both be highly satisfying and dangerously seductive affairs; but done together they are a reality check: they reveal both your own limitations and prejudices and those of your technologies of production; they expose all of the contradictions of the world around you (eg, the demand to achieve ‘impact’, but with no resources or budget; the expectation to create resonant experiences for your audiences, but shackled to the bureaucracy and the often inflexible accountability mechanisms of your employer); the deep frustrations of trying to inspire people without reducing yourself to superlatives, and while simultaneously trying to cultivate reflection and critical thinking. In this way, the process keeps you grounded: you never achieve the perfect output because your critique/evaluation always keeps you aware of the many small and large scale weaknesses involved in the practice, in your tools, and in the broader supporting infrastructures. Some, I think, might call my speciality ‘heritage interpretation’, but as I said yesterday, I hesitate to use the term because I find it limiting and misconceived. While I have many criticisms of the notion of heritage interpretation, my major one is its lack of recognition that it can apply to both non-expert and expert audiences, as opposed to non-expert audiences alone. The frequency with which you’ll see heritage interpreters recognised as potentially meaningful contributors to expert-to-expert dialogue is negligible (or nonexistent). The entire profession seems to have been built up around the idea that experts do their own kind of interpretation – and, separately, non-experts need a special kind of approach that heritage interpreters must facilitate, but that field specialists have no need for and/or from which little obvious ‘expert’ benefit can be derived. For this reason, I think, it is rare to find heritage interpreters embedded in primary fieldwork teams. They are almost always tack-ons to the end of a project producing ‘non-expert’ output after-the-fact, and even where photographers or illustrators or other creative producers are part of the field-based team, the opportunities they are given to act as more than mere recording and output devices—ie., to actually experiment with their creativity and push other field specialists to engage in systematised dialogue about how such practice changes understandings of the archaeological record—are rare. In what I see as amongst the more destructive and unthinking developments in archaeology of the last 20 years, ‘cyberarchaeology’ has entered the scene, claiming to be able to offer “unprejudiced” representation of the past by enrolling digital media into a campaign of achieving more and more precision, speed, resolution, supposed immersion, and purported objectivity and “virtual reversibility” of excavation via totalised forms of recording. There is often reference here to ‘time travel’, or suggestions that it will enable ‘anyone’ to relive the entire original excavation experience. (For immediate confrontation with much of this rhetoric, search academia.edu for ‘cyberarchaeology’.) The language used is obfuscating—deploying the wow-factor to draw people into what I would argue is an unproductive, and in many cases fallacious, conversation about the revolutionary nature of the methodologies. 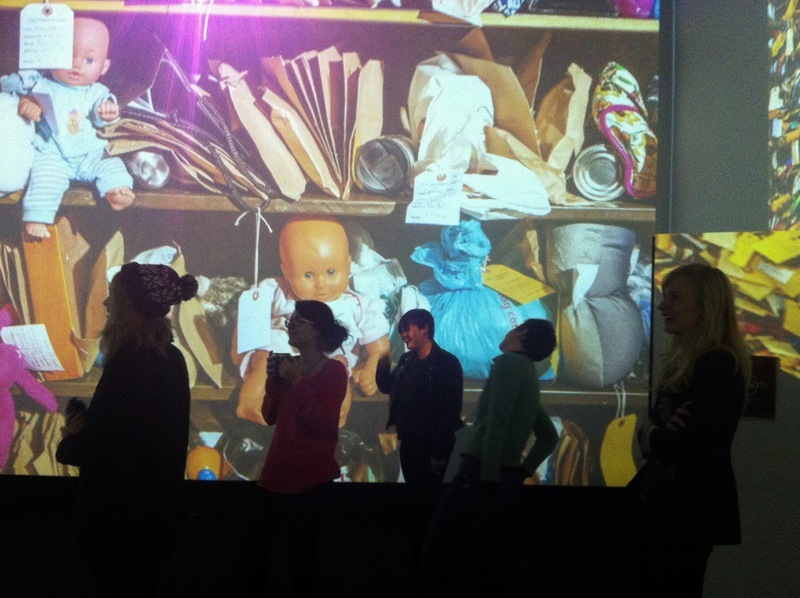 As I described yesterday, I believe there’s some obvious confusion here between the sense of presence, immediacy and control of the cyberarchaeological environment, and the embodied learning that comes about in uncontrolled settings where messiness, improvisation, active labour, exchange and conscious narrative-building are the norm. Most tellingly, today’s applied digital field methods often tend to cut heritage interpreters (people like me) out of the workflow altogether. If we have any role to play, it’s merely to regurgitate the already supposedly whole and immersive record created by the cyberarchaeological method. That method seemingly has presentation and dissemination inherent within it (e.g., see Levy et al.’s 2012 (p.5) model)—captured via its visual and other technologies—so any creative work by interpretation specialists would appear effectively redundant. But the problem, I would argue, with this model of practice is that it is dangerously blind to the true power of heritage interpretation—and to the capacities of the digital (and analogue) media themselves. Anyway, I have a lot more to say about the dynamics at play here, but I’ll save that for future publications/debate, and I’ll cut to the chase of my 20-minute paper. We’ve been experimenting with what happens when you forcibly insert heritage interpreters into the primary fieldwork context. Last year, supported by a generous grant from the British Institute at Ankara, Angeliki Chrysanthi, myself, and our visualisation team from the University of York and Ege University, in partnership with the international CHESS project, used a mixed analogue-digital storytelling methodology with the Çatalhöyük Research Project’s on-site specialists in order to develop a prototype mobile app for site visitors. We’ve described that storytelling methodology elsewhere (online, open access) and variations of it have been trialled across multiple cultural sites—all to great effect, not least because of its impact on experts. Enrolling Çatalhöyük’s site’s specialists into the narrative-making process changed the way many of those specialists thought about their own research and practice. You can read about some of their experiences here, but the point is that it stimulated a different, productive, rich methodological and theoretical debate, as well as conceptual collaboration, between those who often do not participate in the ‘heritage interpretation’ process. I don’t want to exaggerate the impacts of the story-making activity, but the response to it was positive, and even described as ‘liberating’ by some. In the end, my aim is to suggest that heritage interpreters have an important place at the trowel’s edge, not only because they mediate between it and external audiences, but because they can do so with specialist audiences too. Heritage interpreters’ specialism is in inspiring people, facilitating dialogue, working through meanings. Their skillsets are relevant to everyone—regardless of whether those people are experts or not—and they have especial relevance at that crucial moment, on the excavation site itself, when this inspiration and meaning-making is really taking off. To have them missing from, or voiceless in, the primary archaeological fieldwork context is to suffocate archaeological interpretation overall. Excellent post! Critical engagement throughout the entire process, from field to stakeholder to conference dissemination–something has to change. At least the CAA no longer has a ban on Google Glass or other digital wearables. I hope. Wish I’d been there for the talk. I know it will have been stimulating and brilliant. Too many field archaeologists have become mere technicians, search for greater and greater accuracy and preservation instead of thinking about meaning and communication, or indeed their own feelings about what they are recording and excavating (if they allow themselves to have feelings at all). Interpretation of archaeological remains as heritage should be an essential part of all archaeology, as should expressing our subjectivity about the past. Not sure if this is in anyway related to your talk but I needed to have rant! What an excellent post. I am glad those of us who couldn’t attend CAA were able to follow it on Twitter and now get the details here. In past projects I have spent a lot of my own personal time acting as a ‘heritage interpreter’ or attempting to – because just as you said above, this was not a role embedded into the site structure, even though it is important (one might even say critical). I would certainly welcome a change to this. This makes for interesting reading for me – when I did my MA at York (nearly 30 years ago!) this is exactly the area I wanted to work in: interpreting what archaeologists do and why our heritage is important, for ordinary people. Acting as an interpreter, not of the heritage itself, but in the more classical sense – occupying the middle ground between the “man in the street” and the academic, enabling each side to get some kind of insight into the totally different mindset of the other. The ultimate aim being, of course, for archaeology both physical and disciplinary to benefit. Sadly, I graduated at exactly the wrong time, and with far too little independent wealth, to be able to put my ideas into practice!